The port of Tromsø, northern Norway's largest city, lies between Narvik and Hammerfest on a small island 349 kilometers north of the Arctic Circle. Established in the 13th century, Tromsø remains an important fishing port, as well as a popular location from which to view and study Norway's famous aurora borealis, or northern lights. Each year in late January/early February, Tromsø hosts the Northern Lights Festival, a musical extravaganza that attracts artists and symphonic orchestras from across Scandinavia. One of the most popular things to do is experience the midnight sun, visible here from mid-May through mid-July. Tromsø's northern location and natural harbor ensure the city remains important as a base for Arctic expeditions, as well as for the numerous Norwegian fishing vessels based here. It's also a much-used jumping-off point for ferries and cruise ships to and from major ports such as Bergen, and in summer for coastal cruises to destinations such as Spitsbergen. Plan your sightseeing adventures in the city with our list of the top-rated tourist attractions in Tromsø. The Tromsø Arctic-Alpine Botanic Garden and its unique collections are a must-see for those interested in Northern Norway's unique flora. Despite the snow, the flowering season starts early in May, rewarding visitors with displays of purple saxifrage and yellow cushion plants, pasqueflowers, and a variety of flowering bulbs. The garden is divided into 25 collections, each showcasing a different cold-weather species or region, including plants of the Himalayas, the Arctic, and other extreme climates, as well as traditional Norwegian plants. Among its most prized specimens are the giant Tibetan blue poppy and a wide variety of cold-hardy rhododendrons, and another favorite garden features traditional medicinal plants from the region. Flowering continues until the snow returns in October. It's hard to miss Polaria, Tromsø's unique new museum dedicated to everything to do with the Arctic, located just a few minutes' walk from central Tromsø. Designed to look like Arctic ice floes that have been forced up onto land, the exterior resembles a toppling set of dominoes. Here, visitors will find a variety of exhibits about the Arctic, including an extensive installation showing how climate change is having an irreversible effect on the glaciers and Arctic wildlife, as well as a film about the aurora borealis (northern lights). It is also home to an Arctic Aquarium, which features resident bearded seals and several species of Arctic fish. Tomsø's location more than 321 kilometers inside the Arctic Circle makes it an ideal home base for polar expeditions, and because of this it was named the "Gateway to the Arctic" in the late 19th century. The Polar Museum is one of the best places to visit to learn about the area's long history, from its discovery and first settlements to the whaling industry, which once flourished here, and its eventual transformation into a central Arctic research base. Exhibits include historical information about some of the earliest expeditions and explorers like Fridtjof Nansen and Roald Amundsen, as well as exhibits that present the findings of the continuing extensive research. The museum's newest exhibit, Polar Night, looks at the fascinating world of Arctic wildlife during the endless nights of winter. Just before the Tromsø Bridge on the mainland sits Tromsdalen Church, better known as the Arctic Cathedral (Ishavskatedralen). This striking example of the bold modern architecture now common throughout Norway was designed by Jan Inge Hovig in 1965. Hovig's design ties in elements of divine worship with the Nordic surroundings, echoing the shape of ships' sails and the stark white of the ice. It is a major landmark and tourist attraction, visible from incoming flights and from Tromsø Sound. The cathedral's most famous feature is its 1,500-square-foot glass mosaic designed by artist Victor Sparre. The Nordnorsk Kunstmuseum is a free art museum, which is close to both the harbor and the main Tourist Information Office in Tromsø. The permanent collections include more than two thousand works in various media from the 1800s through the present, and featured artists include Edvard Munch, Harriet Backer, and Anna-Eva Bergman. The museum's first floor is dedicated to changing art exhibitions, all of which have a theme directly related to life in the far north, from the effects of climate change to the struggles inherent in a region where darkness and cold envelop everything for several months each year. This unique museum of photography does far more than display a half-million images, which explore present-day and historical Tromsø. Arranged in a documentary-style presentation, the photographs not only illustrate life in Tromsø but also explore a variety of thought-provoking cultural and societal topics, which encourage discussion and enduring curiosity. Collections include the work of both local and international photographers, as well as assorted artifacts and archives from the Tromsø Folk Museum and the Tromsø Town Museum, which contribute to its value as a cultural research center. The Tromsø Museum's most popular area is dedicated to the Northern Lights, acting as an educational center, which allows visitors to get hands-on with the science behind the phenomenon. Exhibits include a look at the history of aurora borealis research, a thorough explanation of what makes these lights appear, and even an area where you can create your own show in the plasma chamber. There is also a film, free guided tours, and admission includes a complimentary book about the topic. The museum is also home to an extensive natural history department, which looks at Arctic life including migratory birds and sea life, as well as human history in the region. Exhibits focus on the ways humans affect the natural world, both in the short-term and long-term. The museum also houses two ecclesiastical galleries, which feature examples of artwork from medieval German churches, as well as Norwegian art from the Lutheran Era. Constructed in 1861, Tromsø Cathedral is located southwest of the main quay in the city center. This Gothic Revival cathedral is the northernmost Protestant cathedral in the world and the only cathedral in Norway made entirely of wood. The wooden cathedral's altarpiece is a spectacular copy of Adolph Tidemand's Resurrection. Other important features include the large stained glass windows in the front of the church, designed by celebrated artist Gustav Vigeland and installed in 1960. To the west of Tromsø's town center stands the Elverhøy Church (or kirke). Built in 1803, this beautiful red wooden structure was originally located at the site of the city's cathedral, but was dismantled and moved in 1861, then again 100 years later to its current location overlooking Tromsø. Notable interior features include an ornately carved altar and pulpit, an organ loft, and a medieval Madonna carved in wood. It has an active congregation as part of the Church of Norway. The Science Center of Northern Norway, home to Norway's largest planetarium, offers visitors a thrilling up close look at Tromsø's spectacular northern lights on its huge digital screen. In addition, the center offers visitors a chance to explore regional phenomena and universal questions on more than 80 interactive installations covering arctic related themes such as energy, climate, and weather, as well as resources and the environment. One of the museum's largest exhibits focuses on the unique nature of life deep within the Arctic Circle and how this affects every aspect of life, from the economy to everyday life. About 32 kilometers south of Tromsø on the east side of the island of Kvaløy lies the village of Hella and its open-air museum containing a number of houses from old Tromsø. Also worth a visit are the Kvinnafossen Falls, located between Leikanger and Hella. They are particularly stunning during the spring thaw, when visitors park on the road to feel the spray from the waterfall. Hella is also home to prehistoric rock carvings dating as far back as 7000 BC, one of which is open to the public for viewing; additional prehistoric carvings can be found in Tennes at the edge of Balsfjord. Starting life as a customs station in 1789, Skansen is the oldest house in Tromsø. Even older than this picturesque house and the many smaller buildings that surround it are its foundations, the remnants of medieval fortifications dating from the 13th century. Today, the building houses a small café, which is open during the summer months and serves traditional food in a cozy atmosphere, and the grounds are a lovely area for picnics. Clarion Hotel The Edge: 4-star hotel, city and water views, contemporary decor, delicious complimentary breakfast. Scandic Ishavshotel: mid-range pricing, beautiful harbor views, stylish decor, floor-to-ceiling windows, free breakfast buffet. Clarion Collection Hotel With: affordable rates, water views, modern decor, sauna and steam room. Comfort Hotel Xpress Tromso: budget hotel, sleek decor, multilingual staff, bathrooms with heated floors. 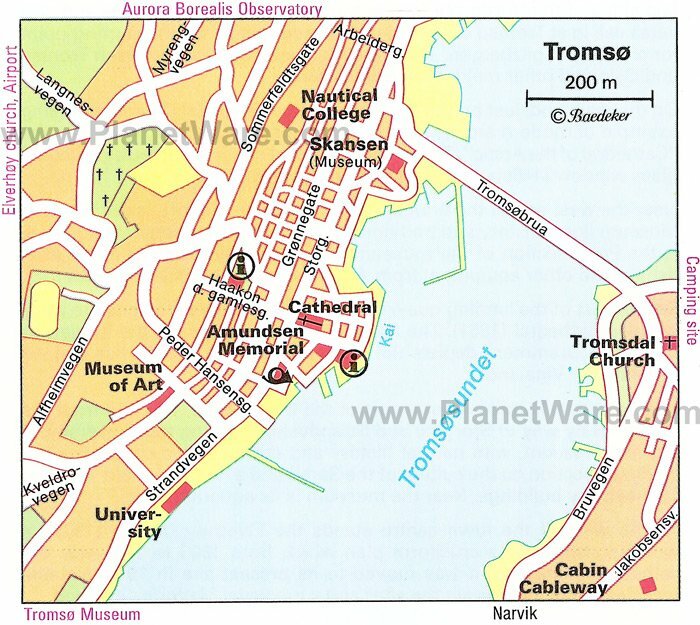 Tromsø by Foot: Tourists can get the most out of a short visit to Tromsø by taking the 2.5-hour Historical City Walk tour. Led by a local guide, this sightseeing walking tour explores the city's medieval settlement, the marketplace, and several of its most significant buildings, including Ølhallen, once the social hub for Tromsø's fishermen. The tour also includes admission and a guided tour of the Polar Museum. Snowmobile Safari: Winter sports enthusiasts will be thrilled to embark on the Lapland Lyngen Alps Snowmobile Safari from Tromsø. After a ferry ride and a quick safety lesson, tourists are provided with all the necessary gear and a two-person snowmobile. The tour explores trails through valleys and along mountainsides, including plenty of stops for photo-ops, and ends with a warm meal before heading back to Tromsø. Exploring the Fjords: The best way to truly appreciate the beauty of the fjords is from the water, and a wildlife sightseeing cruise on the traditional wooden Fjord Queen gives you the opportunity to view and learn about the Arctic wildlife in the area. An expert guide will help you spot the region's many inhabitants, including reindeer along the shore, a wide variety of birds such as puffins and sea eagles, and marine wildlife including pilot whales and even dolphins. For those who prefer to travel by land, the five-hour guided fjord excursion by bus from Tromsø includes mountain and sea Arctic scenery. The expert local guide knows all the best spots for photographs, including picturesque villages and scenic vistas that look out over the fjords. The guide also provides interesting commentary about the Arctic, the area's history, and its people, and can help you spot wildlife like reindeer and birds. Northern Lights Experience: No trip this far into the Arctic Circle is complete without seeing the aurora borealis, and the Small-Group Aurora Hunt Northern Lights Tour from Tromsø takes the guesswork out of finding the ideal spot. Once your expert guide has evaluated weather and other conditions, the group will settle down around a bonfire and enjoy supper while waiting for the lights to appear and learning about the phenomenon. Once the show is in its full glory, your guide will even give pointers on how to get the best shots and will also take photos, which are sent to you after your tour. Arctic Beauty: On the northern fringe of Norway, Tromsø is close to the junction of Sweden and Finland, where you can explore the Swedish Lapland, home to Abisko National Park, as well as the Finnish Lapland. Not quite as far north but still within the Arctic Circle, the Lofoten Islands have an amazingly mild climate and are another good vantage point for getting a glimpse of the northern lights. Norway's Most Epic Fjords: If you are also planning on visiting southern Norway, a tour of the country's most impressive fjords is highly recommended. Sognefjord is the largest, splitting the shore into a chasm for 204 kilometers east from the coastal town of Sygnefest to Skjolden. A few hours south, the Hardangerfjord area surrounds the second largest fjord in Norway, not far from the attractions of Bergen.